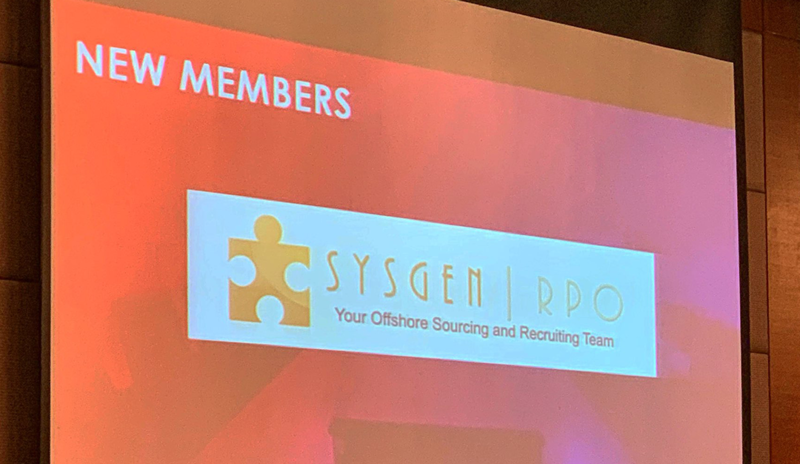 Manila, Philippines – Sysgen RPO, Inc., an offshore recruitment process outsourcing (RPO) service provider in the Philippines, was recently inducted as the newest member of the Information Technology and Business Process Association of the Philippines (IBPAP). IBPAP’s Annual Membership Meeting was held last March 19, 2019, at the Isabela Ballroom in Makati Shangri-La, Manila. As the enabling association for information technology and business process management (IT-BPM) in the Philippines, IBPAP plays a crucial role in sustaining the rapid growth of the IT-BPM industry. The association works relentlessly to ensure an enduring supply of high-quality labor, support service innovation, and provide country visibility for the IT-BPM sector in the Philippines. IBPAP has over 300 industry and support-industry members, including six partner associations. They are considered as one of the major information and advocacy gateway for the IT-BPM sector in the Philippines. With Sysgen RPO as the newest IBPAP member, the organization is the only RPO company that is currently part of the association. The partnership and collaboration from IBPAP and its new members like Sysgen RPO are expected to propel the IT-BPM industry in the Philippines to greater heights. Sysgen RPO CEO Jimmy Roa attended the IBPAP induction ceremony, together with Learning and Organization Development Manager Coby Cristales, Operations Manager Eza Caberto, and Business Development Executive Roger Stephen Rivera. “Joining organizations like IBPAP is a very good experience for companies like ours. This is a perfect venue to meet different IT companies and learn from each other’s challenges and success through their various monthly activities,” said Roger Stephen Rivera, Sysgen’s Business Development Executive. Mr. Rey Untal, IBPAP’s President & CEO, presented a recap of last year’s events and accomplishments, including IBPAP’s current projects and priorities for 2019. IBPAP also introduced the new Board of Trustees for 2019-2021 to both the current and newly appointed members. Aside from Sysgen RPO, the event also welcomed Argus, DTCC – The Depository Trust & Clearing Corporation, Dexcom, Generali, Höegh LNG, KDCI, Multinational Currencies Business Process Outsourcing, Refinitiv Philippines, Transcom Awesome OS, and Workbank to the IBPAP Membership Circle. “It will definitely boost the branding of Sysgen RPO since we are the only member of IBPAP that is an RPO company. I think we can expand our reach because of IBPAP. I hope we get to participate in several programs that IBPAP creates,” he added. 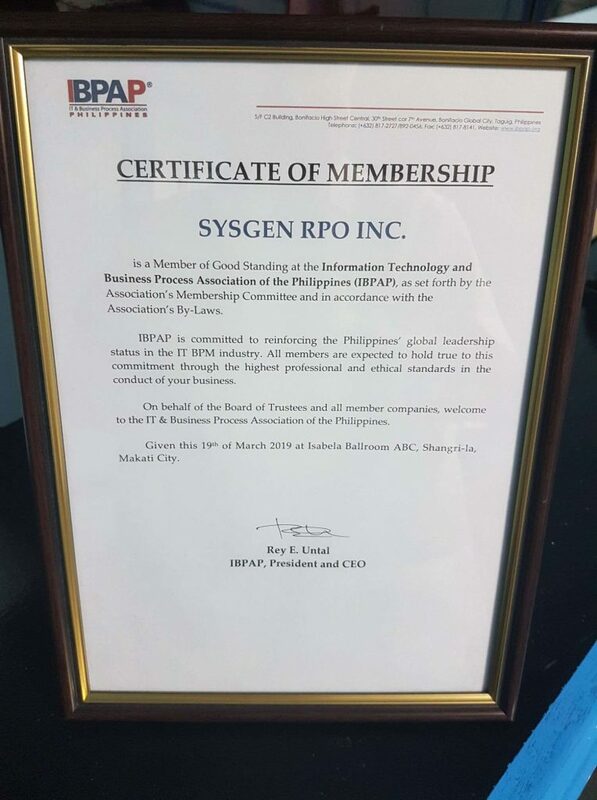 Honored to be officially part of the esteemed association of industry leaders, Sysgen RPO is looking forward to working with the members of the IBPAP community as they take a more proactive role in supporting the development of the IT-BPM sector in the Philippines.